Preparing extra proteins, like chicken, hard boiled eggs, bean salad, quinoa, tuna salad, etc. is a great way to help keep your health goals in check. These lemon-dijon chicken tenders AND Buffalo Spiced Chicken are an easy and delicious way to prepare for your week! To get into detail about this recipe's superpowers....Cabbage is such a wonderful vegetable to use that I don't think we use enough! This recipe is bold in flavors and textures - plus it's super easy if you are already using pre-shredded bags of produce! Try this delicious (and healthy) Shredded Slaw in Peanut-Thai dressing! Need easy? Want healthy? Getting bored of the same 3 dishes can be one of the main reasons I hear new clients have gone back to old (unhealthy) habits after trying to make changes in the past... so here is your answer - 3 Ingredients to a new inspired burger! 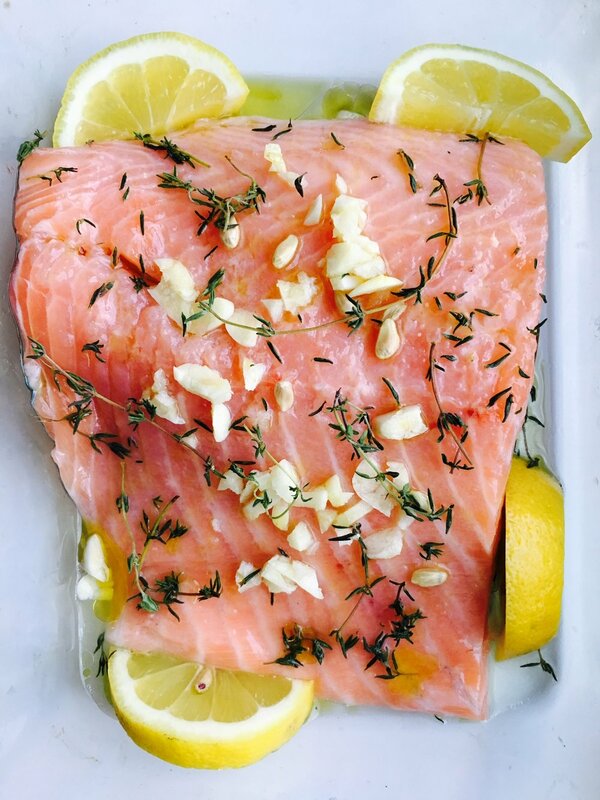 This baked garlic salmon is SO easy, takes only 5 minutes to put in the dish, and then 15 minutes to cook. The mediterranean style flavors of lemon, extra virgin olive oil, and thyme make for a delicious table favorite. Pair with a side of roasted asparagus or a simple arugula salad. Need a super easy meal to make and serve throughout the week in lunches, dinners, heck even a snack if you really wanted? This is a go-to meal that your entire family will love (especially if they love "buffalo sauce"). Just 2 ingredients, and less than 2 minutes to drop into the crockpot! This recipe is one that is super SIMPLE - it takes about 15-20 minutes from start to finish. You can use ground beef or turkey and any type of peppers to this dish. Serve as is (personally the easiest option) or with a side salad, or even stuffed into taco shells or a tortilla for "Burrito" style. Either way, cooking at home in a one pan meal is easy and something anyone can do! This is an easy 20 min meal that you can make and serve multiple ways throughout the week - whether it's lunch, breakfast, dinner or a veggie fiber rich snack! The importance of being prepared for the week is crucial to being successful in your health goals. This easy EASY dish, uses fresh ingredients, herbs (parsley) that has potent liver detoxifying properties, and the whole grain QUINOA (one of my absolute favorites) which is high in protein AND fiber. Have this meal for dinners, lunches, or small serving for snacking. Enjoy! This recipe is my favorite because it takes no time at all, tastes delicious and is high in protein with some fiber rich carbs. It's just TWO ingredients with a flavor of cinnamon and vanilla.